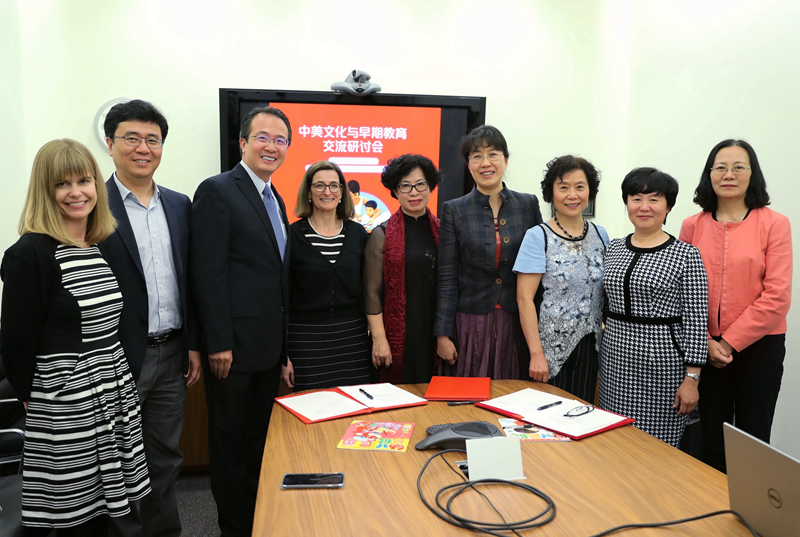 On August 8, Consul General Hong Lei attended the signing ceremony of an agreement on early education among China Children's Press & Publication Group (CCPPG), Beijing First Kindergarten and Erikson Institute. Ms. Zhang Nan, Editor in Chief of CCPPG, Mr. Zhang Mingzhou, Director of international cooperation department of CCPPG, Ms. Huo Liyan, Professor of Beijing Normal University, Ms. Liu Jinyu, Principal of Beijing First Kindergarten, Ms. Chen Jieqi, Senior Vice President of Erikson Institute and Ms. Nina Zolt, Editor in Chief of Cricket Media also attended this signing ceremony. Consul Zhang Min was also present at the event. Consul General Hong Lei said that currently China-US relations face a good development opportunity. The mutual understanding and friendship between the two peoples is the basis of the continuous development of bilateral relations. The exchanges and cooperation in the field of early education between China and the US are not only to explore a new channel of cultural and educational exchange, but also strengthen the basis of mutual understanding of the two peoples. Consul General Hong Lei extended congratulations on the signing cooperation agreement among CCPPG, Beijing First Kindergarten and Erikson Institute. He hoped that the cooperation will contribute to promoting mutual understanding and fostering friendship between children of two countries. CCPPG is the largest children's press and publishing house and a leader in children's digital publications in China. Published by CCPPG, Infant Pictorial and Pre-School Pictorial targeting children aged 0-7 have over three million readers in China. In September 2016, CCPPG reached a cooperation agreement with Cricket Media, which is a global children’s learning company and award-winning publishing house for children to release the English version of Infant Pictorial and Pre-School Pictorial in the US.